These muffins are certainly not beauty queens, but after one bite you will understand why we are posting about them. They are personally my (Celine’s) favorite muffin ever, which is saying something since we make tons of muffins (probably at 2-3 flavors a month!). We have occasionally brought them in to school for a homeroom breakfast treat, and they are always very happily received and eaten! These are not anywhere near healthy, because of the large quantities of butter and sugar, but that’s what makes them good! 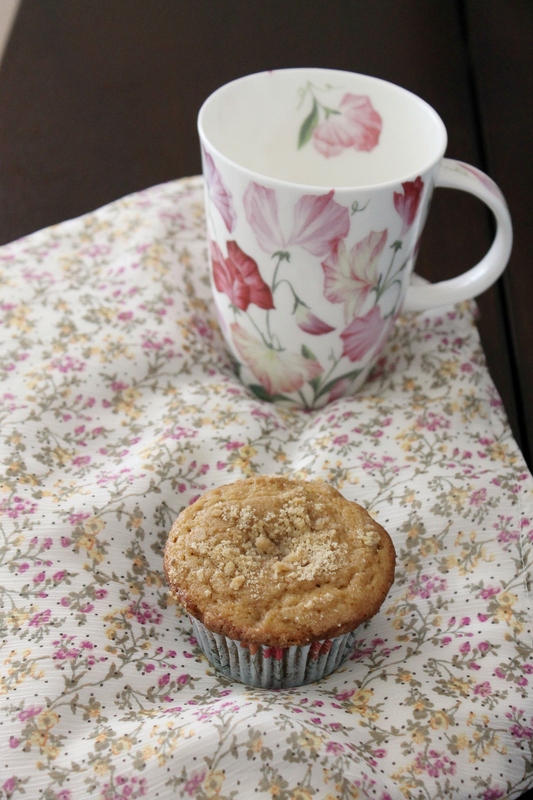 They are perfectly spiced with cinnamon and nutmeg and topped with a yummy streusel. The edges get crunchy, and the cake is tender and delicate. There is, in my opinion, no better muffin than this. Plus, they are perfect for fall! Position a rack in the center of the oven and preheat the oven to 350°. Line muffin pans with liners or grease well with butter or baking spray. Put the flour and brown sugar into a a large bowl and stir with your fingers or a fork to mix well. Break the butter into a few pieces, drop them into the flour mixture, and, using your fingertips, lightly rub the butter and flour together. When the mixture looks like coarse bread crumbs, you’ve mixed enough- don’t worry about any little lumps. Measure out 1/2 cup of the mixture and set it aside to use later as the crumb topping. Add the baking powder, baking soda, cinnamon, nutmeg, and salt to the flour mixture and stir with a fork to mix well. Add the buttermilk and beaten eggs and, using a large spoon, mix until the ingredients are well blended and the batter is thick and shiny. Spoon the batter into the muffin tins, filling each cup at least two-thirds full. Sprinkle the top of each muffin with a rounded teaspoon of the reserved crumb mixture and pat it gently onto the batter. Bake for 25 to 30 minutes, or until a toothpick inserted into the center of a muffin comes out clean. Serve warm and enjoy!